DENVER, March 27, 2017 /PRNewswire/ -- eLoyalty, a TeleTech Technology company, today announced that it will be providing demonstrations of its flagship contact center solutions in the TeleTech Technology booth (#1727) at Enterprise Connect, March 27-30, at the Gaylord Palms Convention Center in Orlando, Florida. TeleTech Holdings, Inc. (NASDAQ: TeleTech) is a leading global provider of customer experience, engagement and growth solutions. eLoyalty's newest offerings for the mid-size business, Experience and Experience+, will be the star attractions. Leveraging over 25-years of expertise in designing, implementing and servicing enterprise-scale customer experience solutions with the Cisco® Hosted Collaboration Solution (HCS) and traditional premises-based platforms, this stability and expertise have been bundled into solutions ideal for companies with 75 to 400 customer contact representatives. With features including email, chat, optional SMS, icPortal®/icPortal Mobile, IVR, CRM integrations, 24x7x365 support, high availability, disaster recovery, and enterprise-class security, the scalable eLoyalty Experience and Experience+ offers transform the aspirational into the operational for the mid-sized business contact center. 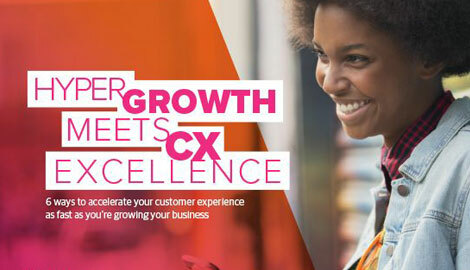 In addition, eLoyalty will feature demonstrations of CX offerings, including its Workforce Optimization (WFO), Customer Relationship Management (CRM) and Managed Services (MS) solutions. "We'll have test drives of all sorts in place for conference attendees," said Steve Pollema, President, eLoyalty/TeleTech Technology. "In addition to demonstrations of our exciting enterprise-class solutions now available for mid-sized businesses, we will also have a racing simulator, allowing booth visitors to test their driving skills and contend for daily leaderboard prizes!" For more information, please visit the TeleTech Technology Enterprise Connect microsite to learn about how you can fast-track your customer experience, and why TeleTech Technology and eLoyalty are your tickets to ride to the next level of customer experience. eLoyalty, a TeleTech (NASDAQ: TeleTech) company, was the first North American partner to achieve Cisco HCS Certification and Contact Center as a Service Designation, has received the Cisco Advanced Technology Partner Certification for Contact Center Enterprise and Customer Voice Portal, and the Cisco Customer Satisfaction Award every year since 2007. We are the only Cisco Cloud Partner offering a solution with this type of increased flexibility and capability incorporated directly into the HCS platform. With a 95 percent client renewal rate, eLoyalty has proven itself a deserving partner as it helps chart customer experience technology roadmaps, implementing cloud systems to provide safer, faster, smarter, and more agile service interactions. For more information, visit eLoyalty.com. Cisco and the Cisco logo are trademarks or registered trademarks of Cisco and/or its affiliates in the U.S. and other countries. A listing of Cisco's trademarks can be found at www.cisco.com/go/trademarks. All other trademarks are the property of their respective owners. icPortal is a trademark of eLoyalty, a TeleTech Company. For more than 26 years, Enterprise Connect has been the leading conference and exhibition for enterprise IP Telephony, Converged Networks and Unified Communications in North America. Enterprise Connect brings corporate IT decision makers together with the industry's vendors, analysts and consultants to focus on the issues central to enterprise networks and communications. Enterprise Connect owns and produces No Jitter, providing daily blogging and analysis of enterprise communications, and it also serves the community with a weekly email newsletter and a Webinar series. For more information, visit enterpriseconnect.com. Enterprise Connect is organized by UBM plc. UBM is the largest pure-play B2B Events organizer in the world. Our 3,750+ people, based in more than 20 countries, serve more than 50 different sectors. Our deep knowledge and passion for these sectors allow us to create valuable experiences which enable our customers to succeed. Please visit www.ubm.com for the latest news and information about UBM.